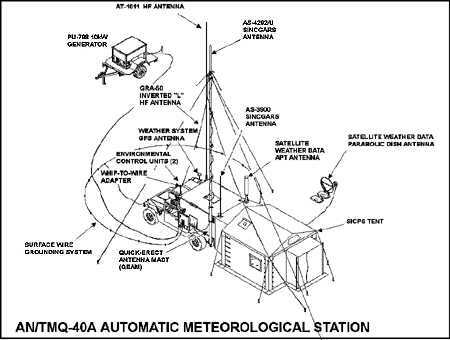 The Integrated Meteorological System (IMETS) is the meteorological component of the Intelligence and Electronic Warfare (IEW) subelement of the Army Battle Command System (ABCS). IMETS provides commanders at all echelons with an automated weather system to receive, process, and disseminate weather observations, forecasts, and weather and environmental effects decision aids to all Battlefield Operating Systems (BOS). IMETS is a mobile, tactical, automated weather data receiving, processing and dissemination system. It is designed to provide timely and accurate weather and environmental effects forecasts, observations, and decision aid information to multiple command elements at all echelons supported by weather teams. The IMETS is an Army-furnished and maintained system operated by Air Force weather team personnel. It uses US Air Force (USAF) and Army developed software to provide a total weather system to support the Army. IMETS is a heavy High Mobility Multi-Purpose Wheeled Vehicle (HMMWV) mounted tactical system which provides automation and communications support to staff weather teams assigned to echelons from brigade through Echelons Above Corps (EAC) and to Army Special Operations Forces. IMETS receives weather information from polar-orbiting civilian and defense meteorological satellites, Air Force Global Weather Center, artillery meteorological teams, remote sensors and civilian forecast centers. IMETS processes and collates forecasts, observations, and climatological data to produce timely and accurate weather products tailored to the specific Warfighter's needs. IMETS provides weather information overlays for the Common Tactical Picture (CTP), meteorological messages and other tailored products. IMETS provides direct client access to the IMETS meteorological database and to the database of weather impacts on friendly and threat systems. Three different configurations are tailored to the needs of the echelon supported; 1) command post configuration (CPC) for fixed facilities at echelon above corps (EAC) level where the IMETS is permanently integrated into the local area network; 2) vehicle mounted configuration (VMC) for tactical operations where the supported echelon moves frequently; and 3) light configuration (LC) for a small task force, where lightweight, easily deployed core weather functions can be performed without having its own vehicle, shelter, and power source. This system supports the Current to Future transition path of the Transformation Campaign Plan (TCP). The most significant weather and environmental support to Warfighters is the automated tactical decision aids produced by the IMETS. These graphics go beyond briefing the weather by displaying the impact of the weather on current, projected, or even hypothesized conditions on both friendly and enemy capabilities. Instead of reacting to the weather, the Warfighter can take advantage of the weather. IMETS is the centerpiece of Owning The Weather (OTW). The Battlescale Forecast Model (BFM) is the focal point for tactical weather forecasts. The BFM provides forecasts of numerous weather parameters at 10km resolution (higher resolution planned). Information from the BFM is made available to the Integrated Weather Effects Decision Aid (IWEDA) software tool to generate weather effects on tactical systems. The force multiplier of the weather can then be used by decision makers for tactics and maneuver. IMETS is predominantly a Non-Developmental Item (NDI) that provides automation and communications support to USAF Weather Teams assigned to Army G2/G3 sections at echelons Brigade through EAC. IMETS receives, processes, and collates forecasts, observations, and climatological data to produce weather forecasts and timely and accurate products to meet Commanders' requirements. IMETS produces, displays and disseminates, over Army ATCCS ABCS, weather forecasts and tactical decision aids that compare the impact of current, projected, or hypothesized weather conditions on friendly and enemy capabilities. IMETS workstations are ATCCS ABCS Common Hardware and are interoperable with ASAS, DTSS and other ATCCS ABCS BFAs over tactical and area communications. IMETS has a streamlined evolutionary acquisition strategy, relying heavily on commercial off the shelf/Government off the shelf (COTS/GOTS) and Non-Developmental Items (NDI) products. These products are then packaged into upgrades and enhancements to the fielded IMETS. IMETS Block I was fielded to 15 high priority units in FY95/96. 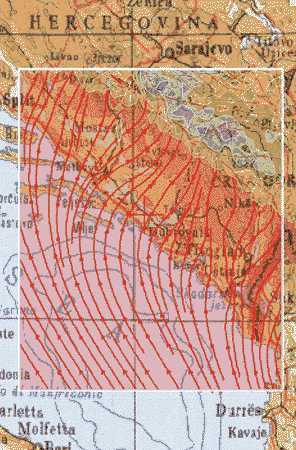 The IMETS Block II fielding effort was initiated in FY97. A successful Developmental Test and Operational Assessment was completed in February 97 with the Milestone Decision approved on 15 April 97. On 15 June 98, the IMETS Project office successfully completed a program review in response to Y2K and the Air Force Re-engineering effort. The results of the program review was to initiate a Y2K contingency plan which called for the removal of fielded non-Y2K compliant processors, the reconfiguration of IMETS to a single processor configuration, and upgrading to IMETS Block II software prior to March 1999. The Block II IMETS, AN/TMQ-40A, is configured in a Standard Integrated Command Post System (SICPS) rigid-wall shelter, mounted on a High Mobility Multipurpose Wheeled Vehicle-Heavy (HMMWV-H). It contains a standard configuration of Army Tactical Command and Control System (ATCCS) (ABCS) common hardware/software (CHS-2) and communications. The transportable computer unit, mass storage expansion unit, light weight computer unit, communication interface device and the AN/FCC-100 modules of Block I IMETS are replaced by the High Capacity Computer Unit (HCU) in IMETS Block II. The system requires a standard support vehicle to transport tentage, antennas, and other basic issue items in the field. Each Block II system tows a PU-798 generator. IMETS is a critical part of the IEW support to the Warfighter. The system provides first-in weather support to contingency forces, tailored weather information for deep fires and Precision Munitions, and weather effects decision aids for the planning and execution of maneuver and support. The IMETS actively participates in the Force XXI initiatives ensuring that IMETS is an integral part of the Army's digitization effort and that it will continue to meet the Warfighter's needs into the 21st century. IMETS is a product of and managed by the Army's Intelligence Fusion Project Management Office. The Office of the Project Director, Integrated Meteorological System was established to centralize the management and expedite the acquisition and fielding of a weather processing and forecasting system and was assigned to the Program Executive Officer Command and Control Systems in February 1991. The following units are scheduled to receive Block II IMETS. Since early 2005, Defense contractor Northrop Grumman has been working to integrate the various hardware and software associated with IMETS into the Army's ABCS. Northrop Grumman was awared the systems integrator title for the IMETS in 1992. The IMETS development program integrates efforts from the Air Force, Army, and OSD DII COE. It is consistent with the development of the C4I Joint Technical Architecture-Army. The IMETS Non Developmental Item acquisition strategy proved successful in the fielding of Block I IMETS and this strategy is being continued with the Block II program. Current improvement efforts are to incorporate new numerical weather prediction forecasts and products communicated from centralized Air Force Hubs to the individual IMETS. Weather tactical decision aid upgrades and updated forecaster aids are developed to include products from Air Force initiatives. IMETS data and applications are being made accessible to Battlefield Functional Area C4I systems as clients through weather database services within the IMETS; hosted on the ABCS Information Server (AIS) and/or through the Joint Common Data Base (JCDB). Application modules from the Army Research Laboratory will be integrated and fielded as an upgrade to the current software baseline. These include: improvements in generation and display of higher time resolution and higher spatially resolved weather forecast and effects information; inclusion of physics-based weather decision aids and models; development of more versatile weather databases that support a variety of service and allied weather forecast models and environmental databases; development of weather applications consistent with joint METOC data standards; development of weather remote-sensing products from meteorological satellites; and ingest of battlefield sensor data to augment initializing mesoscale forecasts. IMETS functionality has been ported to a laptop computer to respond to requirements for a lighter more flexible IMETS for the highly mobile units. Fielding decision for these Interim IMETS Lights was accomplished in 3QFY02.